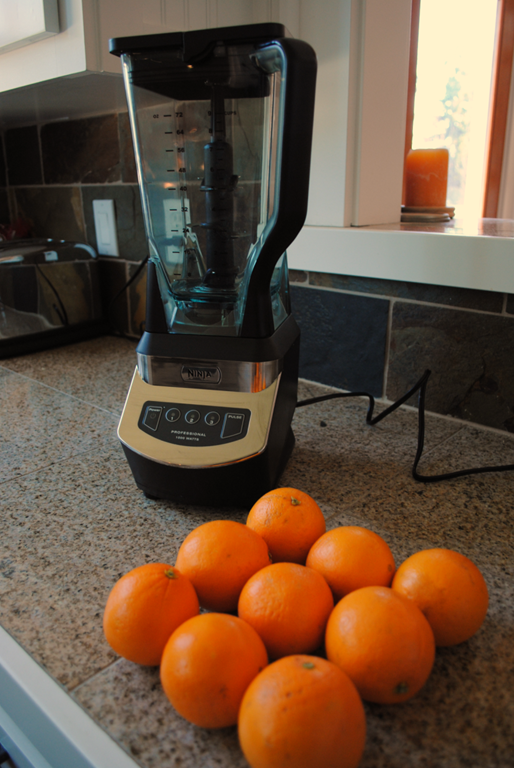 Recently, a reader posted a question about juicing with the Ninja on my blender review page. She wanted to know how well it works for juicing, and if it requires a lot of water to produce juice. I honestly didn’t have a good answer because I hadn’t tried using it for juice. My first inclination was that if you’re after only juice, a traditional juicer is probably the way to go. 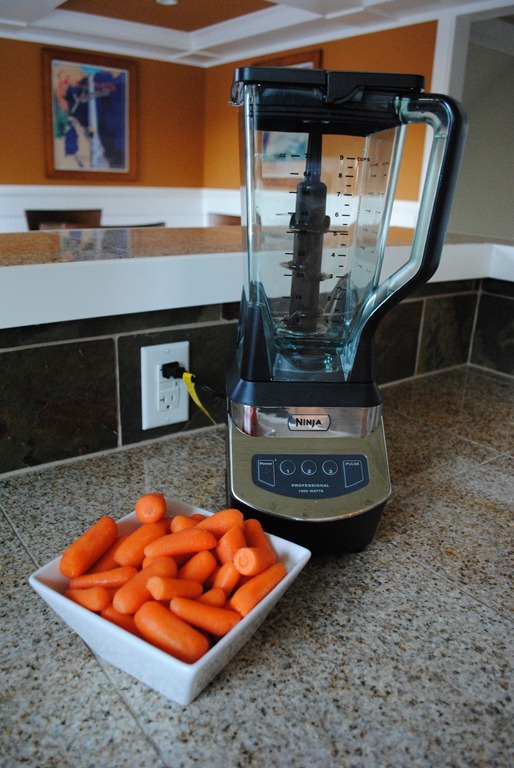 Curiously, the Ninja infomercial shows that it can be used for juicing, but I was unable to find anything about juicing on their website, which made me think it was a bit of a stretch for the blender. After doing a couple juice tests and successfully yielding juice, I’m changing my mind a little (not entirely, though). I did a little quick research, and it seems you can get a decent juicer for about $99, give or take, which is also the price of the Ninja Professional Blender. The complaint with juicers seems to be that they make a big mess on the inside that is hard to clean and you have to really chop stuff up to juice, you can’t put things in whole. With the Ninja, you can put in big chunks of pretty much anything and it devours them, so there are no worries there. It is also super easy to clean. 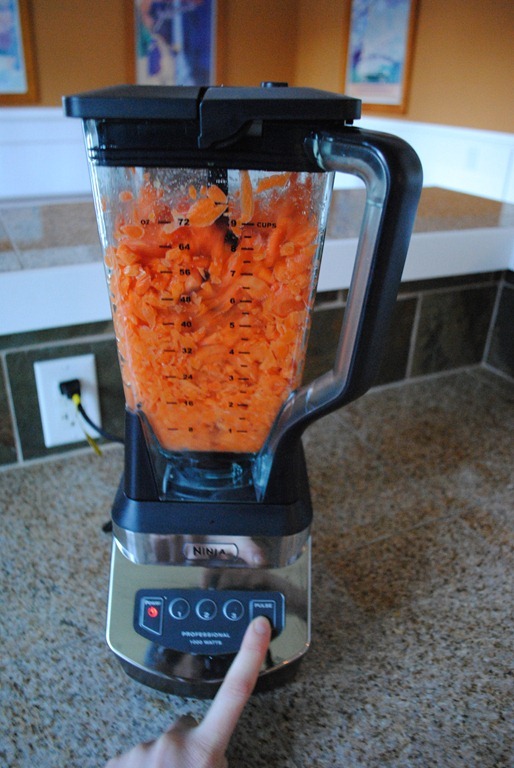 Unlike dedicated juicers, you do have to add water so that it will blend to a smooth consistency, but not huge amounts (in my uninformed and inexperienced juicing opinion). I’m not sure if adding water is considered a drawback or not. The main drawback, I think is, that after blending, if you want just juice without pulp, you will have to strain the pulp separately. Bottom Line: If you want juice from your Ninja because you don’t want to buy a dedicated juicer, I can honestly say it works. However, if you are a daily juicer, I would still probably recommend a dedicated juicer due to the required manual straining. 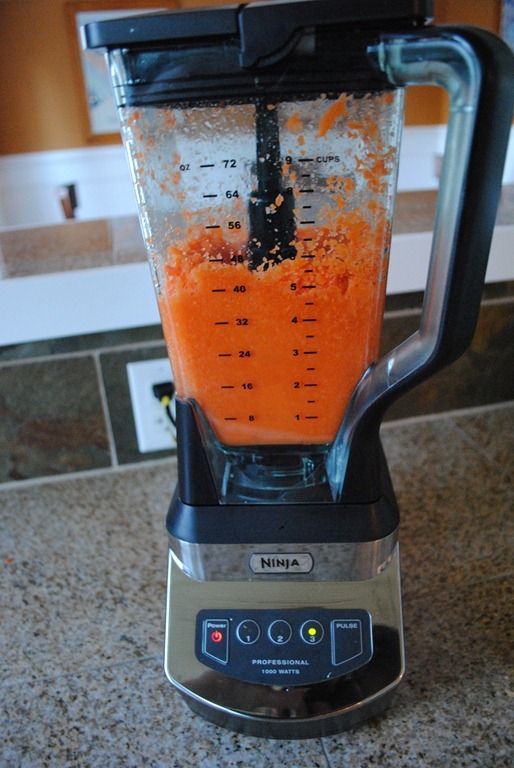 Here’s a look into my little experiment, in which I juiced oranges, and separately, carrots. I picked up a bag of small oranges for this experiment, and then peeled them with a knife to make sure I removed most of the white fuzz that remains if you peel them with your hands. I picked these small oranges because larger naval oranges aren’t as sweet to me, and I didn’t want to add any sugar. I dropped them in as whole as possible (mostly in halves). 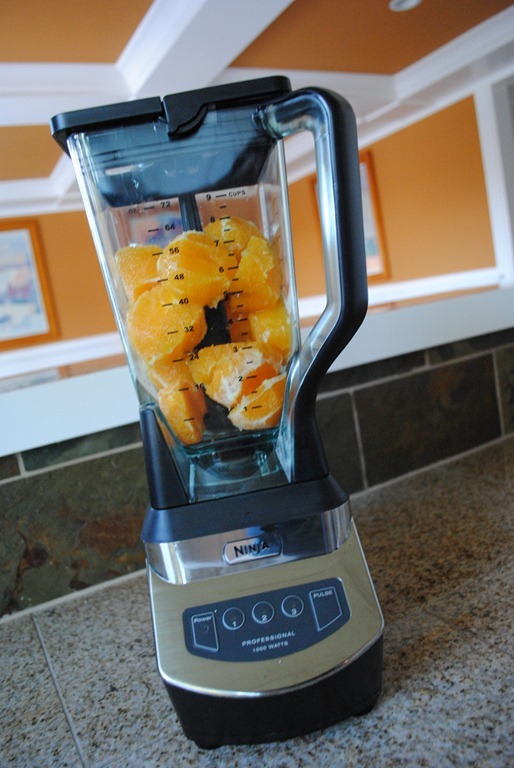 Then, I pulsed a few times to mix them up, and then blended on “1” for about 30 seconds, until the oranges were fully blended. At this point, I started adding water. I started small, with about 1/3 cup, and eventually ended up using about 1 full cup to get the juice into a somewhat thick, but juice-like consistency. You could definitely get away with adding less water, but I wanted to be sure I would get a decent yield of juice. I blended on “3” for about one minute to get the pulp broken down fairly well, and then strained through a sieve to get out as much juice as possible, pressing with a spatula to make sure the leftover pulp was very dry. 10 small oranges (I didn’t picture one of them because I had already cut into it) yielded 20 ounces of juice, with about 2 cups of pulp. I tried to make creamsicle ice cream from the pulp, but sadly, it wasn’t even edible, probably because all the sugar was squeezed out of it! The end result was definitely orange juice, and it tasted really good. I’m not a big orange juice drinker, but I downed this juice happily because it didn’t have added sugar. 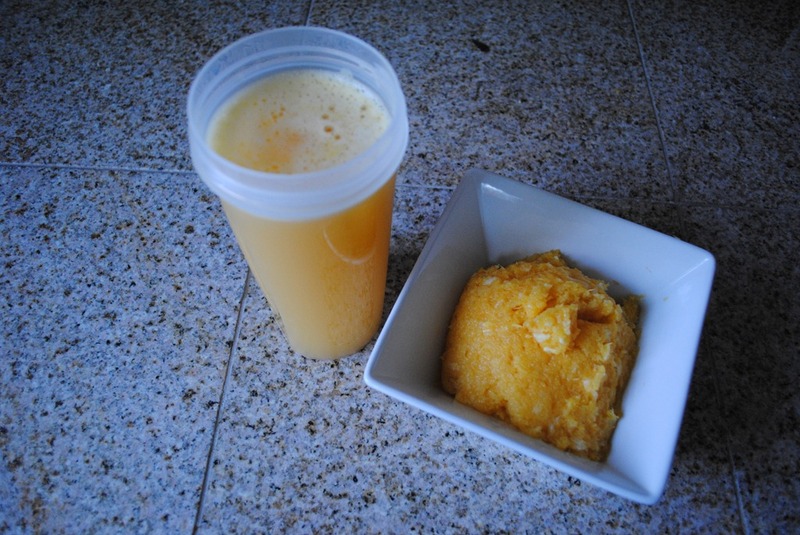 20 ounces was about 3 days worth of juice (small servings), so, 3.33 oranges per serving. 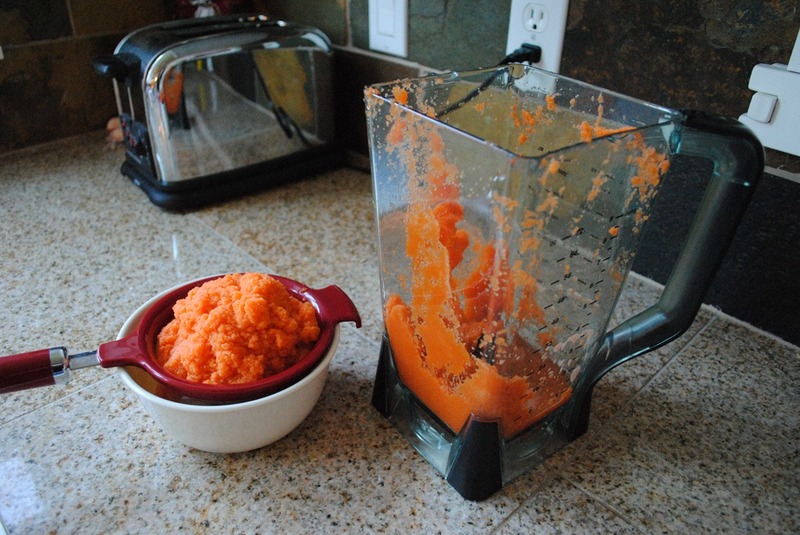 I chose carrot juice as the second juice trial because carrots aren’t as inherently “juicy” as oranges, and, because I’ve been working on a carrot cake muffin recipe, so I knew I had a use for the pulp. 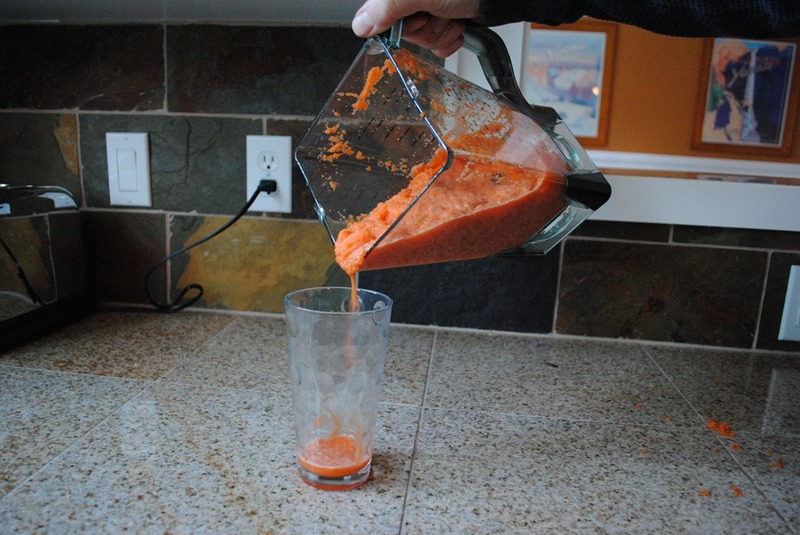 I am kind of surprised at how well the carrot juice came out! Safeway had a sale on peeled baby carrots, and our dog Pipa loves baby carrots, so I went with those over full sized carrots (less work is a good thing). This is roughly 3 cups of baby carrots. 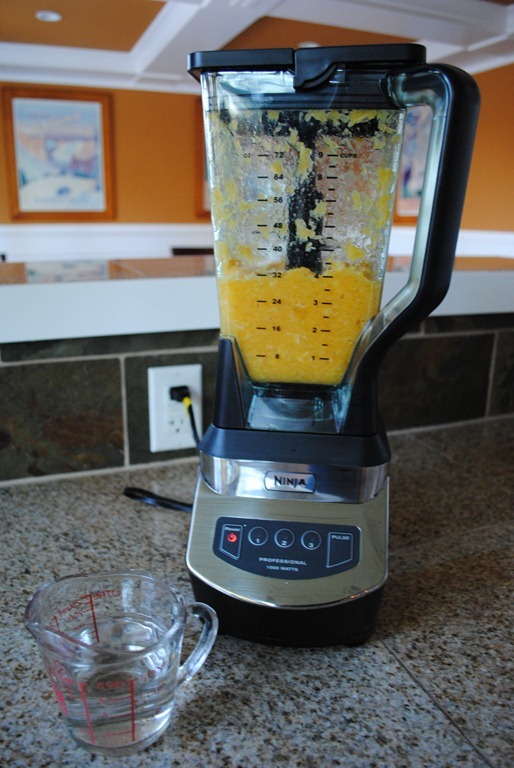 Much like the orange juice, I pulsed a few times to combine, and then blended on level 1 for about 30 seconds. This left a carrot purée, so I started adding water slowly to figure out how much was needed. I ended up adding about 3/4 cup in total, and blended on level 3 for about 1 minute. Then, it was time to strain. I had 2Chili pour out the blended mixture so you could see the thickness pre-straining. 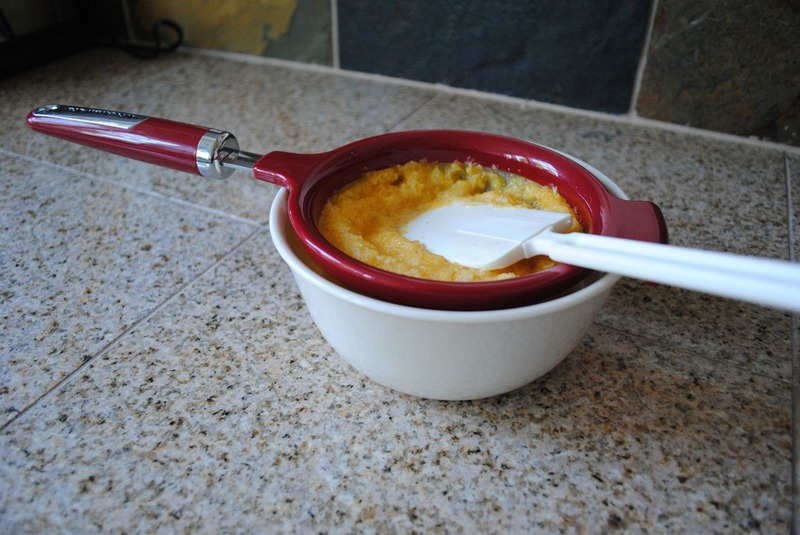 The same method was applied here – strain in a sieve, and push the liquid through the mesh strainer with a spatula. 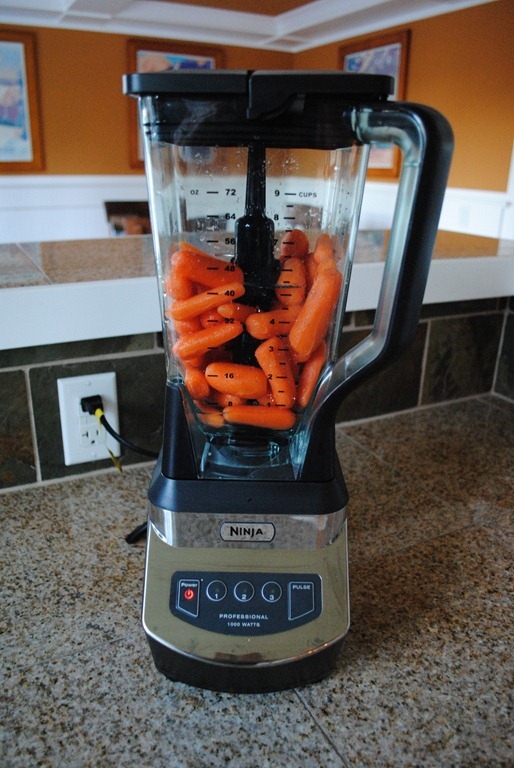 In this case, 3 cups of carrots yielded about 16 ounces of carrot juice. 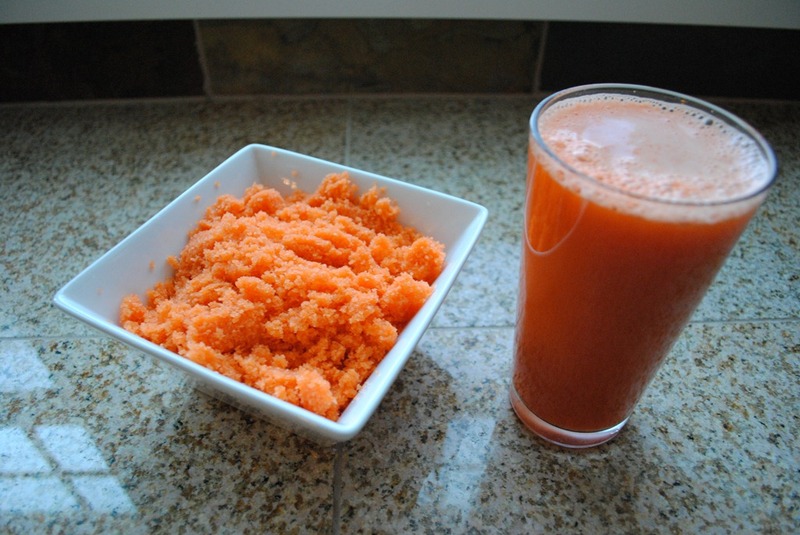 I had never tasted carrot juice – it was surprisingly good! I used the leftover pulp in muffins, which worked better than trying to use the leftover orange pulp, but wasn’t as good as just shredded carrots. 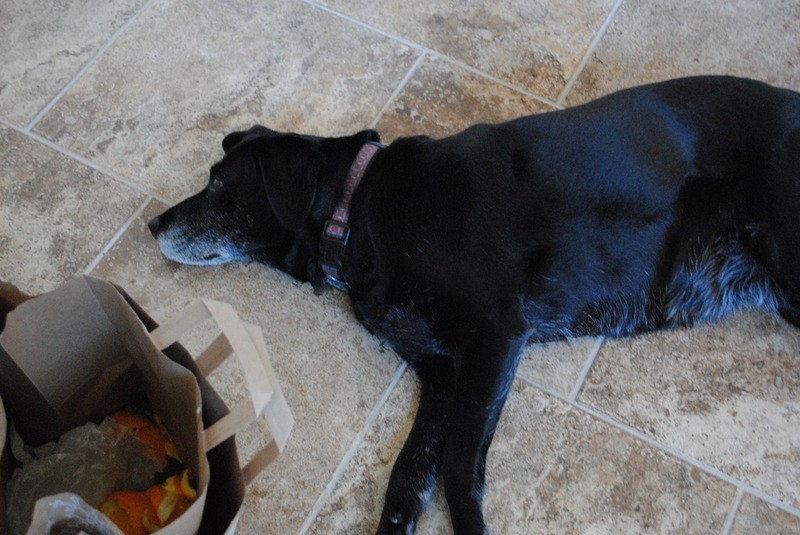 While all of this juicing was going on, my helper was steadfast by my side, hoping for a scrap of anything to fall her way as I dropped peels into the compost bag. This is not unusual, but today she was looking extra dejected! I’m more into smoothies and green drinks, I don’t know that I’ll juice very often, but it is nice to know that option is available. Happy blending!